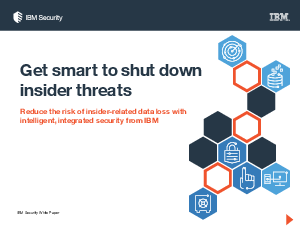 An interactive white paper describing how to get smart about insider threat prevention - including how to guard against privileged user breaches, stop data breaches before they take hold, and take advantage of global threat intelligence and third-party collaboration. Security breaches are all over the news, and it can be easy to think that all the enemies are outside your organization. But the harsh reality is that more than half of all attacks are caused by either malicious insiders or inadvertent actors.1 In other words, the attacks are instigated by people you’d be likely to trust. And the threats can result in significant financial or reputational losses.